Let's be honest here for a second folks, the Palm OS can be a little stale in the graphical department. But just because Uncle Eddy hasn't gotten around to hiring a new designer for good old Garnet doesn't mean that your Palm OS device has to keep that, shall we say... classic tried and true look. UltimatePhone is one such app that can instantly breathe new life into your phone interface. It provides a graphically rich dialing and addressbook application "shell" that also gives you a photo contacts list, shortcuts and links to some common mobile services and a Google Search bar right on your home screen. 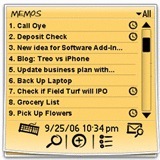 One of the most common functions of my Treo is to take and keep a ton of notes with the good old memopad. Like much of the rest of the OS, this classic function has essentially remained unchanged since it debuted on the Pilot 1000. Enter TreoMemo. Not only does this app put a modern and friendly face on your memo's, it also packs in some nice enhancements as well. It includes an assortment of colorful skins, thumb scrolling, improved search, "type to" navigation and the ability to easily sms and email your memo's. You can even take the makeover systemwide. 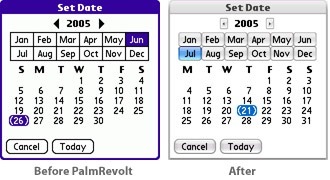 PalmRevolt is a Palm OS skinning utility that can reshape nearly every app on your device. It works surprisingly well and won't slow down your device or get in the way of things if you don't want it too. Now you can finally give your Treo the Cobalt look it always wanted or choose from among some of the excellent skin selections over at 3GX's site. Another tweak that compliments it well is FontSmoother. FontSmoother gives your text the anti-alised treatment and will let you use your own custom or converted fonts. It's a must have if you do a lot of reading on your device. If you prefer to keep things simple, SprayPaint will let you further customize the system colors in ways the prefs pane won't allow. One thing is for certain, the Palm OS has no shortage of Weather software. Despite the breadth of choice and freeware options, a few apps stand out above the others in my mind. 4cast from SSH is the most functional weather tool. It has excellent one handed navigation and presents more detailed information in an easy to digest format than other apps. My second choice would go to Gx5 for TreoWeather and its graphically rich presesntaion. Palm made a good decision a few years back to drop the incredibly lame RealPayer, and began to bundle the leading Palm OS digital audio player - Pocket Tunes. 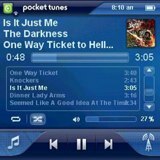 This is a great music player that can play and organize all of your mp3's stored on a memory card. Just don't forget the stereo headset adapter if you actually want to enjoy your music on a decent set of earbuds. If you step up to the full pTunes deluxe version, you get access to a good assortment of skins, streaming Internet radio, music subscription service support and Windows Media Player integration. On the video side of things Palm really shorts its customers. The built in video player is a little weak to put in nicely. 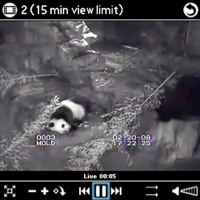 Fortunately for us, there is CorePlayer Mobile, which can play just about any video format and size you throw at it flawlessly. Combined with some DVD converting software, such as Palm Media Studio or DVD Catalyst, you can load up your SD card and watch a couple movies on your next flight or view a legitimately downloaded video clip while you're one the elliptical at the gym. Video addicts and YouTubers will enjoy Kinoma Player EX. In addition to being a robust video and media player, Kinoma can stream many video and audio podcasts via its excellent built in media guide. Kinoma also lets your search, browse and play all sorts of YouTube videos. Seriously, Rob, the primary developer at Hobbyist Software, spends his waking days improving on and adding features and functionality to Palm's smartphones so the folks in Sunnyvale don't have to. 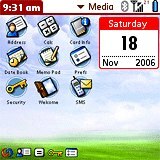 Hobbyist's array of Palm OS utilities range from improving the entire phone experience, to better power saving battery functions to even better alarms and data security. You can check out all of Hobbyist's apps here, or get them all together in their heavily discounted Treo Tastic bundle. Palm OS smartphones owe their heritage to their PDA predecessors. Because of that, there is a large amount of highly developed organizational software available. Sure the built in datebook and contacts will be enough for most people, however for those that demand more there are programs out there that can help organize your personal data and even streamline and improve your business processes. DateBk6 and iambic's Agendus suite are the two heavyweights that add hundreds of features and new capabilities to the standard Palm PIM apps. Both have been around since the the late 90's and continue to be actively maintained today. Going into each is well beyond the scope of this short piece, so be sure to take a look at each and see what fits for you. If you're more inclined to keep your data in the cloud, take a look at Goosync, which can keep your Centreo in sync with your Google Calendar. The company offers both free and premium accounts. Unfortunately, not everyone on this planet speaks English. Even those that do may need to lookup an amphibological word every now and then when reading a book or just surfing the Interwebs. In times like that it is advantageous to have a dictionary handy. 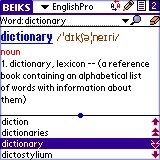 Beiks makes a good one called English Dictionary Pro that will save a few tree's and put over 70,000 words and definitions in your pocket. For foreign language students and travelers, Beiks has got you covered as well. The company has en excellent line of translation tools, phrase books, "talking dictionaries" and even verb conjugation programs. They have all sorts of options and packages available for English, Spanish, French, German, Japanese, Chinese and many others. Are you a news fiend, blogger, journalist or a hopelessly addicted info-junkie? Then you've probably already heard of rss feeds. For those of you that haven't, rss feeds are means that nearly every blog and news site uses to automatically share headlines and articles. With an rss feedreader such as Quick News, you can stay up to date with your favorites blogs and sites on the go. Instead of trying to visit your 10, 20 or 50+ sites individually, you can keep on top of them all at a glance in a palm optimized format. Quick News also supports downloading podcasts and can import your own list of feeds via opml. RescoNeeews is another nice option. For the wikipedians out there Stand Alone also makes an excellent client for reading the Wikipedia articles on your smartphone. Quickipedia adapts content from the site in a speedy and easily navigatable format. Alternatively you could browse Wikipedia directly via PhoneFavs as the site generally does not render well by default with Blazer. If you're the type of person that begins most phone conversations with "this call may be monitored or recorded for quality control and or training purposes" then you'll want to checkout CallRec. You can setup CallRec to automatically record all of your phone conversations to a memory card, or at your command by the press of a button. It can even double as a voice note recorder as well. CallRec isn't the only covert conversational capture utility in town. MotionApps makes a similar utility called mVoice, which we put head to head against CallRec previously. 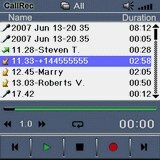 RecorderX is another option that recently arrived as well. With a GPS Navigation kit or a Bluetooth GPS receiver and software you can turn your Treo or Centro into a powerful navigational system. There are kits available that include everything you need to get setup. There are a variety available and most include a Bluetooth GPS receiver, needed for talking to the satellites, navigational software, car mounts and automotive power adapters. Nowadays they even make a gps unit that will fit on your keychain, however you'll still need to bring your own software. There are no subscription fee's for using gps, that's your tax dollars at work folks nearly 20,000 km over your head. If you don't feel like springing for the two piece navigational setup, you can go the poor mans route with the free Google Maps Mobile and Razixs 'My Location' add-on that will attempt to triangulate your current position using cell tower info on supported devices. Launching programs is one of the most basic features on your Palm and the default launcher basically does a good job. Of course there is always a batter way and third party launchers can liven up your device and help you further optimize your device at the same time. Treo Launcher is one of my personal favorites. It lets you display wallpaper and many more icons on the screen at once that the standard fare. It also has a cool date display and a nice row of minature shortcuts along the bottom. Its hidden power lies in its ability to let you bind apps to the number keys and you can even filter the current icon display down with the keyboard. Launcher X is an oldie but goodie, letting you use custom skins, create custom category tabs and has little widgets that display information and give you some enhanced drag and drop capabilities. Another nice option is AppShelf, which has also been around for ages but is still quite attractive and useful. Finally Initiate Pro and the ever popular Zlauncher each share many of the above features and add some cool twists of their own. For even more software ideas checkout our previous article on Treo Freeware, or head over to the PIC Software Store. There is a mobile version on Wikipedia called Wapedia. See http://www.wapedia.org/ for more info. http://pda.wapedia.mobi/en/ looks great on a Treo. I'd been using wikipedia in fast mode which worked, but this is much better! Anybody else see a 'divot' in the apps? Instant Messenger.. Where Verichat has blindly left an absyss like hole. Mundu is completely unstable, with it's "lifetime updates" for 11 dollar promise. When in a year and a half has come and gone. There's been 1 update, and that update remains beta still today. My blackberry friends, can't send pictures to me on the fly. An assortment of friends, say I appear offline, or they appear offline to me. Msn crashes the whole phone at any attempt of communication. Oh, and there aren't any timestamps, so recieve a message and just "hope" to know when it was sent. So what are the freeware weather apps alluded to- Any of them good? What other great freeware for the treo/centro is there? other: 1 touch timer, batmon, olive tree bible reader, manana, minitones. Can't say that I've really used it, but I have HandZipperLite on my Treo 755p. It was suggested elsewhere (maybe MTDN). Personally, I would put TakePhone ahead of UltimatePhone any day of the week. TakePhone is much more functional and stable. I found UltimatePhone to be heavy on looks but light on useful features. Heck, a good 90% of its preferences involve settings to tweak its looks. On the other hand, TakePhone looks good and adds a boatload of features to the built-in Contacts program. Try TakePhone, you will not regret it. Agreed, TakePhone is probably the best choice for CDMA Centro & Treo users envious of the updated phone app on the Treo 680 & GSM Centro. Since I don't use my Treo as a phone on a day to day basis, it's superfluous to me but the general concensus online is that TakePhone is a superb app in all aspects, if you can handle paying $20 to add some functionalit that Palm really should have made standard in some aspects. Any apps/hardware out there to enable wifi on the new GSM Centro? At present there is nothing out there to enable WiFi on a current generation Centro. I wouldn't hold your breath waiting either. what about the epic battle? how come Launcher X won? RE: what about the epic battle? Thanks almost forgot about that, I added it in. Does CallRec work with a headset? mVoice can only record one side of the conversation when using a Bluetooth headset. Does CallRec have this limitation too? CallRec also records only your voice and not the caller's audio that you hear via the Bluetooth headset. Don't use Bluetooth if you want both sides recorded. can someone please help me i purchased a palm centro the other day but now when i try to send text messages it says error (34).any solutions? Take the phone back to Toys R Us and ask for a refund. I've recently upgraded from a PLAM TX to a Newton MP2000! Oooooh...the ex-FanBoy crowd here is FIERCE! sounds a network issue. give it some time an try again. if that fails, call your carrier.